I return home every day at five. من هر روز ساعت پنج به خانه برمی‌گردم. Merry be your Christmas, peaceful be your home, joyful be your family, blessed be each one. Happy, happy Christmas, that can win us back to the delusions of our childish days, recall to the old man the pleasures of his youth, and transport the traveler back to his own fireside and quiet home. Simon left home (= stopped living in his parents' house) at the age of 18. My grandmother lives in an old people's home. I stayed at home yesterday. They have a beautiful home in California. Last night we stayed at home and watched TV. He was spending more and more time away from home. A family of birds made their home (=started living) under the roof. Jack left home when he was 16. Were you still living at home (=with your parents)? Carrie moved out of the family home a year ago. She was born in Italy, but she’s made Charleston her home. The folks back home don’t really understand what life is like here. He’s been travelling, but he’s kept up with what’s going on back home. I’m already feeling at home in the new apartment. After a while we began to feel at home with each other. Practise using the video until you feel quite at home with it. Attractive modern homes for sale. Sit down and make yourself at home. We like to make our customers feel at home. America is the home of baseball. India is the home of elephants and tigers. Birmingham Bullets are at home to Kingston. Can you find a home for the piano? ▪ a secure/stable home (=a caring family without a lot of changes) He had grown up in a stable home. ▪ a happy home (=a happy family) We had a happy home. ▪ a broken home (=a family in which the parents have separated) Many of the youngsters came from broken homes. ▪ the family home (=where a family lives) The house was once the family home of the O'Dare family. ▪ the marital home (=where a husband and wife live) He left the marital home to move in with his lover. ▪ sb’s childhood/boyhood etc home (=where you lived as a child) I had not been back to my childhood home for ten years. ▪ a permanent/temporary home Flood victims were offered temporary homes. ▪ live at home (=live with your parents) More people in their twenties are still living at home because housing is so expensive. ▪ leave home (=stop living with your parents at home) Lisa had left home at age 16. ▪ work from/at home (=do your work at home instead of at an office) I work at home three days a week. ▪ home the house, apartment, or place where you live: More and more people are working from home. | It was past midnight by the time I got home. ▪ house a building that someone lives in, especially a building intended for one person, couple, or family: Shall we meet at your house? | Have you seen Dave’s new house – it’s huge! ▪ place spoken informal the house, apartment, or room where someone lives: We went to Sara’s place after the movie. | He’s just bought a fantastic place right by the sea. ▪ residence formal the house or apartment where someone lives, especially a large or official one: The Prime Minister’s official residence is 10 Downing Street. | His wife transferred her main residence to Spain. ▪ holiday home British English, vacation home American English a house that someone owns by the sea, in the mountains etc, where they go for their holidays: They bought a luxury holiday home in Spain. • We are not far from my home now. • Old people prefer to stay in their own homes. • She leaves home at 7 every day. • While travelling she missed the comforts of home. • He left home (= left his parents and began an independent life) at sixteen. • Nowadays a lot of people work from home. • I'll call you from home later. • (figurative) We haven't found a home for all our books yet (= a place where they can be kept). • A lot of new homes are being built on the edge of town. • Private home ownership is increasing faster than ever. • They applied for a home improvement loan. • I often think about my friends back home. • Jane left England and made Greece her home. • Jamaica is home to over two million people. • She came from a violent home. • They wanted to give the boy a secure and loving home. • He had always wanted a real home with a wife and children. • She has lived in a home since she was six. • This region is the home of many species of wild flower. • The tiger's home is in the jungle. • The Rockies are home to bears and mountain lions. • Arizona is home to the Grand Canyon and the Petrified Forest. • Beverly Hills is the home of the stars. Old English hām, of Germanic origin; related to Dutch heem and German Heim. • My home is very near here. • 200 new homes are being built in the town. • She left England and made her home in Spain. • Fitting a burglar alarm is the most effective way to increase home security. • He came from an appalling home background. • He claimed he had bought the cigarettes for home consumption, not to sell them. • He didn't leave home until he was 24. • He supplements his income with part-time or home work. • He used to spend the summer painting at his country home. • He went missing while on home leave from prison. • He'd always dreamed of owning his own home. • Her job means she's away from home for weeks at a time. • I arranged to meet her in her office, as she seemed more relaxed on her home territory. • I've tried all the home remedies for headaches without success. • It's unusual for young people over 25 to still live in the family home. • Let's go home— I'm tired. 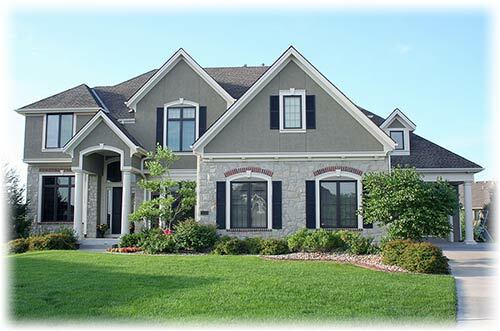 • Make sure you insure your home contents for an adequate amount. • More and more children in the school are from single-parent homes. • My grandmother has a home help who comes and cleans twice a week. • On the home front, the fuel crisis continues to worsen. • Perhaps we could find a home for the kitten. • Placing a child in public care is sometimes the only solution to ill-treatment in the natural home. • Priceless antique furniture was destroyed in the fire at the stately home. • She desperately missed her home comforts while camping. • She had never had a stable home life. • She left her native home in Ireland and went to America. • She missed her mother's home cooking. • The course is suitable for classroom or home study. • The doctor was assaulted on a home visit. • The first time he visited New Orleans he knew he had found his spiritual home. • The hill is the legendary home of King Arthur. • The hotel's friendly atmosphere makes it a real home (away) from home. • The lock-up garage provides a secure home for your car. • The mudflats offer a winter home to thousands of migrating swans. • The newspaper gives priority to home news over international news. • The people abandoned their homes and headed for the hills. • The show gives home-grown musical talent the chance to show what they can do. • The storm wrecked the family's caravan home. • The team are playing away from home. • The team's home form has slumped in recent weeks. • These birds are in danger of becoming extinct as their forest home disappears. • These children badly need a stable and secure home life. • They also have a holiday home in Spain. • They also have a weekend home in the Catskills. • They are a difficult team to beat on their home ground. • They designed and built their own home. • They found their dream home on the shore of a lake. • They hope to sell as many computers on the home market as they export. • They run a retirement home for the elderly. • This computer is marketed for home use. • Try calling me on my home number after six o'clock. • We are offering a free 15-day home trial on our software. • We have a home movie of my dad teaching me to swim. • We have to provide a good home for the children. • Work begins this week on a purpose-built home for the city's homeless. • A family of four was rescued early this morning when fire ripped through their terraced home. • Eventually she had to give up her house and go into a nursing home. • He refused to give up his house and garden and go into a retirement home. • His children were upset when he sold the family home. • I had always thought of India as my spiritual home. • Juliet left England and made Spain her home. • My grandmother moved into an old people's home two years ago. • Nora's parents lost custody, and she was placed in a children's home. • She comes from a broken home. • She had to move to a residential care home when her health deteriorated. • She left home and began an independent life at sixteen. • She made her home in Spain. • The centre provides an adoption programme for pets needing new homes. • We bought a holiday home in France. • We haven't found a home for all my father's books yet. The senator has two homes - an apartment in Washington and a house in Colorado. He was living on the streets for three months, and his home was a cardboard box. Phone me at home after four o'clock. I took home a couple of books to read. He left home (= stopped living with his parents) when he was 23. More and more couples are setting up home together without getting married. We had a happy home. He spent his early years in a home. I live in London, but my home (= where I was born) is in Yorkshire. I was actually born in New Zealand, but I've lived in England for so long that it feels like home now. I wonder what they're doing back home. If a sports team are/play at home, they play on their own sports field. 1) N-COUNT: oft poss N, also at N Someone's home is the house or flat where they live. The General divided his time between his shabby offices in Carlton Gardens and his home in Hampstead. ...the allocation of land for new homes. 2) N-UNCOUNT You can use home to refer in a general way to the house, town, or country where someone lives now or where they were born, often to emphasize that they feel they belong in that place. He has moved back to his home town of Miami. 3) ADV: ADV after v, be ADV Home means to or at the place where you live. Company officials say striking union members should stay home today. 4) ADJ: ADJ n Home means made or done in the place where you live. All you have to do is make a home video. 5) ADJ: ADJ n Home means relating to your own country as opposed to foreign countries. Europe's software companies still have a growing home market. ...the Guardian's home news pages. 6) N-COUNT A home is a large house or institution where a number of people live and are looked after, instead of living in their own houses or flats. They usually live there because they are too old or ill to look after themselves or for their families to care for them. It's going to be a home for handicapped children. 7) N-COUNT You can refer to a family unit as a home. 8) N-SING: with supp, usu N of n If you refer to the home of something, you mean the place where it began or where it is most typically found. This south-west region of France is the home of claret. 9) N-COUNT: oft N for n If you find a home for something, you find a place where it can be kept. The equipment itself is getting smaller, neater and easier to find a home for. 10) ADV: ADV after v If you press, drive, or hammer something home, you explain it to people as forcefully as possible. It is now up to all of us to debate this issue and press home the argument. 11) N-UNCOUNT: usu at N When a sports team plays at home, they play a game on their own ground, rather than on the opposing team's ground. I scored in both games against Barcelona; we drew at home and beat them away. Home is also an adjective. All three are Chelsea fans, and attend all home games together. 12) PHRASE: v-link PHR If you feel at home, you feel comfortable in the place or situation that you are in. I am not completely at home in any Protestant Church. 13) PHRASE: V inflects, usu PHR to n To bring something home to someone means to make them understand how important or serious it is. Their sobering conversation brought home to everyone present the serious and worthwhile work the Red Cross does. 14) PHRASE: v-link PHR If you say that someone is, in British English home and dry, or in American English home free, you mean that they have been successful or that they are certain to be successful. The prime minister and the moderates are not yet home and dry. 15) PHRASE: V inflects If a situation or what someone says hits home or strikes home, people accept that it is real or true, even though it may be painful for them to realize. Israeli officials say that message struck home. 16) PHRASE: usu v-link PHR (approval) You can say a home from home in British English or a home away from home in American English to refer to a place in which you are as comfortable as in your own home. Many cottages are a home from home, offering microwaves, dishwashers, tvs and videos. 17) CONVENTION (politeness) If you say to a guest `Make yourself at home', you are making them feel welcome and inviting them to behave in an informal, relaxed way. So a dreary Monday afternoon in Walthamstow is nothing to write home about, right? • Right now his home is a small apartment. • People are concerned about protecting their homes. • They have a second/vacation home on the lake. • There's no place like home. • I must have left my notes at home. • I will be away from home [=I will not be at my house] for two weeks. 2 [count] : a family living together in one building, house, etc. • She made a good home for her husband and children. • She lived at home [=she lived with her parents or family] until she got married. • He left home [=left his parent's house and lived in his own house] after graduating from high school. • Australia is the home [=habitat] of the kangaroo. • The islands are home to many species of birds. • Can you find homes for these files in your office? • New York will always be home to me. • They made their home [=they settled] on the banks of the Mississippi. • People back home [=in his hometown; in the place he is from] would never believe how much he has changed. • This building will be the orchestra's new home. • The big television networks have their homes in the same city. • She doesn't want to put her mother in a home. • He was tagged out at home. • We face serious threats both at home and abroad. • The team has done much better at home [=in its home games] than on the road. • She feels at home on the stage. • They made me feel (right) at home my first day at the new job. • I've never really felt/been completely at home with [=comfortable and confident about using] all these new-fangled machines. • Whenever he came to the city, his brother's place was like a home away from home. ✦You say home sweet home to show that you are happy when you return to your home after being away from it. You need to take care of your family and those close to you first and then go about taking care of other people if possible. اول باید از خانواده و افراد نزدیکت مراقبت کنی و سپس اگر امکانش بود به سراغ مراقبت از دیگران بروی. Don't tell me you lent that money to your colleague. I had told you I needed that for Jenna's university tuition fees! You always forget that charity begins at home.